Are you ready for all things fall and pumpkin spice? 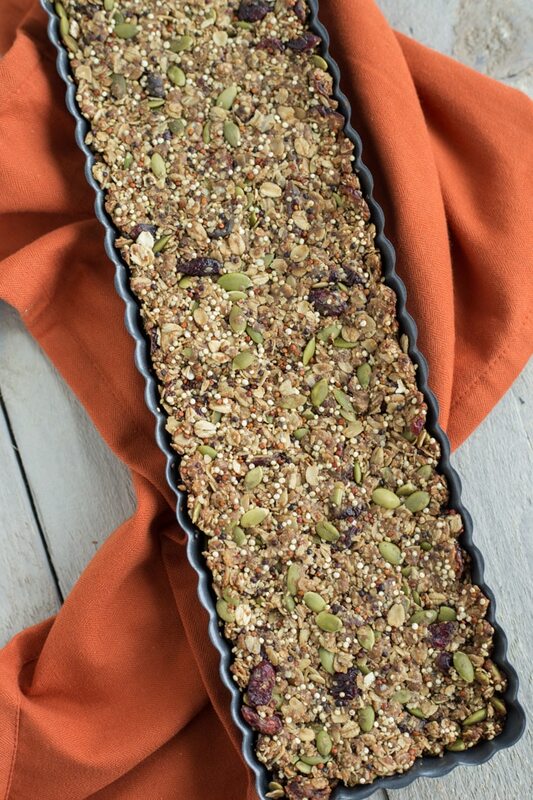 If so, you need these Cranberry Pumpkin Spice Granola Bars in your life! 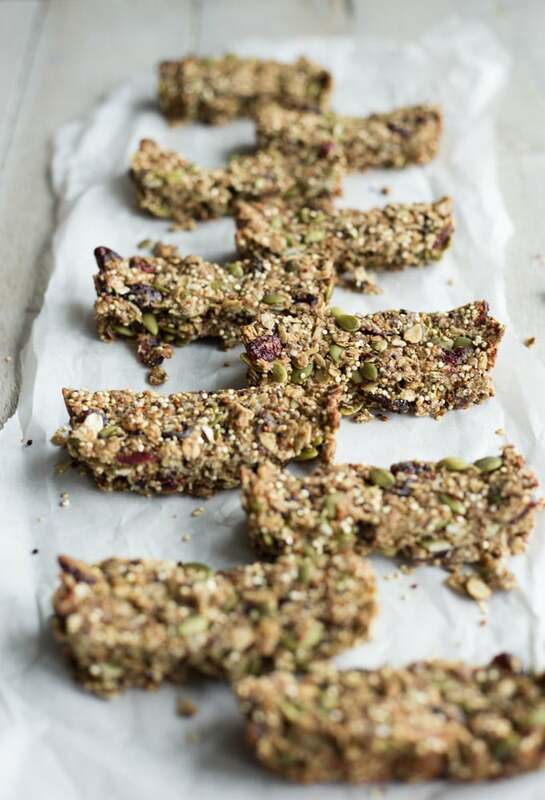 They are nut-free, so perfect for the kiddos to take to school. And they are loaded with oats, cranberries and pumpkin seeds, so totally sophisticated for those of us needing to pack adult lunches 😉 ! In my opinion, fall food is absolutely the best food! The smells and the flavours conjure up such great memories of cozy, comfort food and holiday celebrations. Over the next few months, there are so many holidays to prepare for that centre around food – Halloween, Thanksgiving, Christmas…… I can’t wait to share all the recipes I have swirling around in my head! So to get the ‘most wonderful time of the year’ underway, I’m sharing my first ever pumpkin-related recipe on Crumb Top Baking! I’ve already made 5 batches of these Cranberry Pumpkin Spice Granola Bars, and I’ll be whipping up another batch this weekend. They only take 20 minutes from start to finish, so they are definitely a great addition to your Sunday meal prepping. 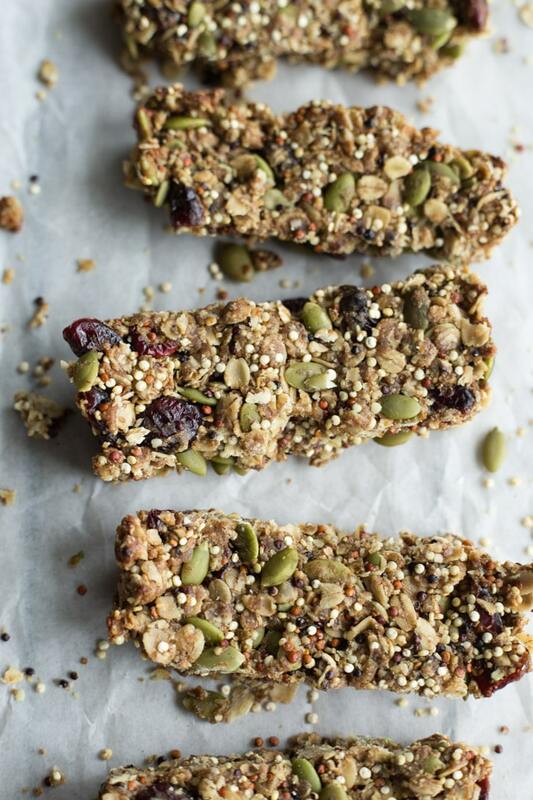 The primary ingredient in these granola bars is gluten-free rolled oats. I always used to bake with regular rolled oats or quick cooking oats, but I recently started using Bob’s Red Mill gluten-free rolled oats and I have to say they are totally awesome. While I’m not allergic to gluten, I try to limit my oat and wheat intake in the run of a day. If I go overboard, I’m guaranteed to experience some sort of bloating and discomfort (TMI 😉 ??). But since I switched to gluten-free oats, I don’t seem to have as many issues. Everything in moderation, of course, but I’m totally enjoying more homemade granola and oatmeal breakfast cookies these days! Yay! So getting back to granola bars, I don’t know about you, but granola bars will forever remind me of my childhood. And when I say childhood, I mean primary school to university 🙂 . 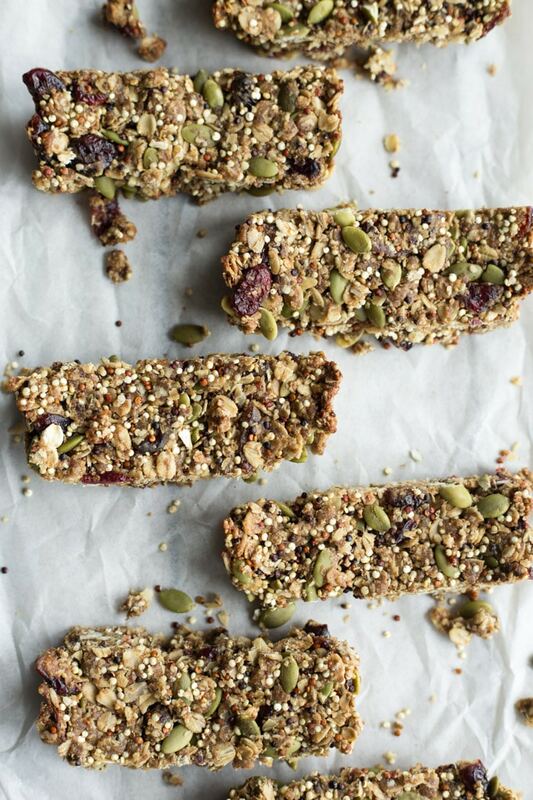 Granola bars are, and likely will forever be, lunch bag staples. Do you remember the Quaker granola bars? I know you can still buy them, but they are the first granola bars I can remember. I’m pretty sure I ate my fair share of chocolate chip and chocolate dipped granola bars. Are you sensing a theme there? If the granola bar didn’t have chocolate in it, I wasn’t having any part of it! While I’m still a lover of chocolate, my taste in granola bars has definitely changed over the years. 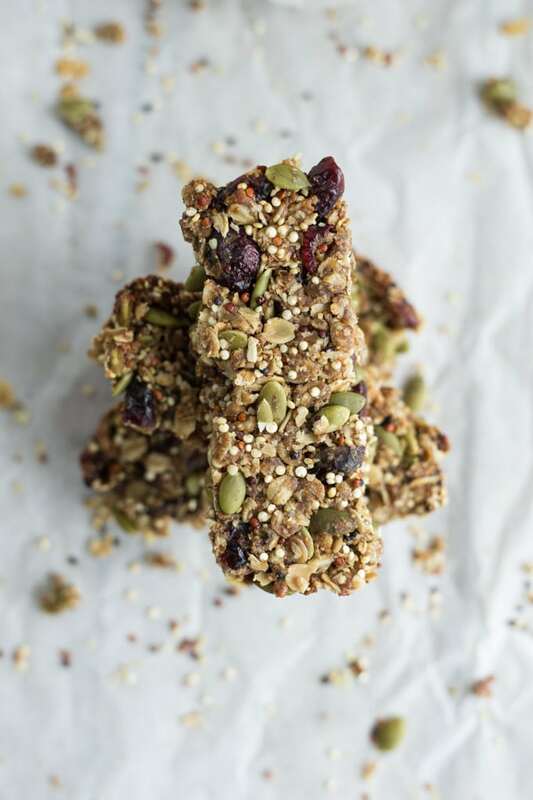 Now I love a hearty granola bar with lots of oats, seeds, nuts and dried fruit…..and maybe the occasional chocolate chip 😉 . These Cranberry Pumpkin Spice Granola Bars totally meet that requirement (minus the nuts this time!). 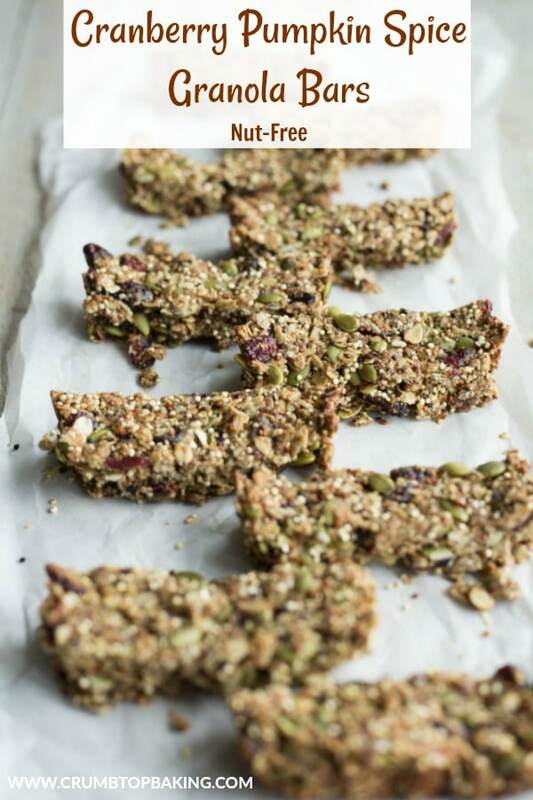 They are made with lots of clean eating ingredients like oats, quinoa, pumpkin seeds, dried cranberries, hemp seeds, coconut palm sugar, pumpkin seed butter and, of course, pumpkin spice! Hello fall and hello pumpkin overload! 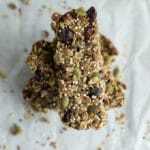 And the best part about these granola bars is that they are not overly sweet and have the perfect consistency – not too crunchy and not too chewy. Juuusssttt right!! 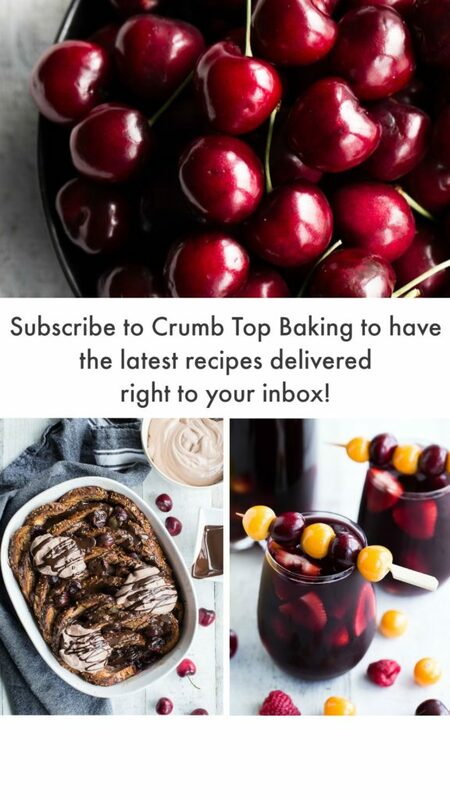 If you make these bars, be sure to take a pic and share on Instagram by tagging @crumbtopbaking. Or let me know your thoughts in the comments below. Enjoy your Friday and the weekend ahead! These Cranberry Pumpkin Spice Granola Bars are nut-free and loaded with oats, cranberries and pumpkins seeds. They only require 8 ingredients and take just 20 minutes to make! And with lots of fibre and clean eating ingredients like gluten-free oats, quinoa, pumpkin seed butter and coconut palm syrup, they are perfect for weekly meal prepping. Pre-heat oven to 350 degrees and grease a 14 inch long rectangular tart pan. In a medium-sized bowl, combine the oats, quinoa, pumpkin seeds, hemp seeds, and pumpkin spice. Stir in cranberries. (See note). Firmly press mixture into tart pan and bake for 12 minutes or until edges are browned. Remove from oven and let cool in pan on cooling rack for 3-4 hours. Remove from pan and cut into 10-12 pieces. Store in an airtight container on the counter. You can buy pumpkin spice at Bulk Barn, but it is only available seasonally. In the off-season, I make my own pumpkin spice by using cinnamon, ginger, allspice, cloves and nutmeg. I follow this recipe at The Pioneer Woman. I like to stir in the cranberries after I’ve mixed up the other dry ingredients with the pumpkin spice. The pumpkin spice tends to stick to the cranberries so waiting to add them minimizes this and more evenly distributes the spice. Allowing these bars to cool in the pan for a few hours will ensure they firm up and will be easier to cut into pieces. After they fully cool, I usually wrap them in plastic wrap and wait until the next day to cut them.